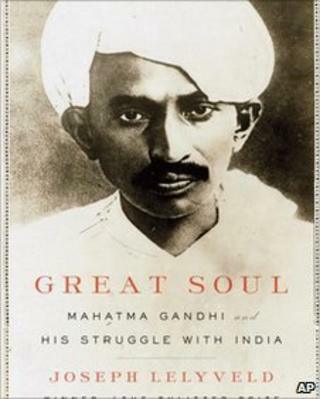 A controversial book on Mahatma Gandhi has been banned by the government in his native state of Gujarat. Chief Minister Narendra Modi said that its contents were "perverse and defamed the icon of non-violence". The book by Pulitzer Prize winning author Joseph Lelyveld contains evidence that India's independence hero had a homosexual relationship. Correspondents say that more bans can be expected in a country where homosexuality still carries a stigma. It was only made legal in 2009. Gujarat's state assembly voted unanimously on Wednesday immediately to ban Great Soul: Mahatma Gandhi and His Struggle With India - even though it has not yet been released in India and few people will have read it. However its contents have been revealed in media reports - based on early reviews in the US and UK - which suggest that Mr Gandhi was sometimes racist and had an intimate relationship with a German man named Hermann Kallenbach. Mr Lelyveld has denied writing that Gandhi was a bisexual, saying his work had been taken out of context. "I do not allege that Gandhi is a racist or bisexual in Great Soul," he told the Times of India. "The word 'bisexual' nowhere appears in the book." However reviews of the book give detailed comment on its coverage of his alleged affair with Mr Kallenbach - a German-Jewish bodybuilder. "How completely you have taken possession of my body," reads one widely quoted letter from Mr Gandhi to Mr Kallenbach in the book. "This is slavery with a vengeance." Mr Modi accused the author of displaying a "perverted mentality" in writing the book, which he said had hurt the sentiments of masses of people. "This publication defames the Mahatma and there is rising anger not only in Gujarat but in the entire country," he said. "The perversion shown in the writings not only deserves to be condemned in the strongest possible terms but cannot be tolerated. I know that the members of this august house share my feelings." He said that the state government had decided to "ban the publication, printing or distribution of the book in the state with immediate effect".